Tamale Making Tips, Tricks and Troubleshooting. Part of the FabulousFoods.com tamale tutorial, these tips will help you get fabulous results when making this classic Latin party food. 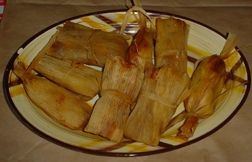 For moist flavorful tamales, don't skimp on the sauces or salsas -- if you are using a meat or tofu filling with a sauce, shoot for about a 2 to 1 ration of sauce to filling. Mix and match your favorites meats, vegetables, seafood and sauces -- almost anything encased in masa dough and wrapped in corn husks can be a tamale. Make sure to completely enclose your sauces and fillings in the masa dough before wrapping the tamale, otherwise the filling can leak, which will cause the finished tamale to be dry. When buying fresh masa, be sure to carefully check the label as sometimes the dough is already mixed for you (usually with lard). Since you will probably want to mix your own dough with healthier ingredients, avoid buying "prepared masa." Some Latin markets will offer two types of fresh masa: fino and quebrado. When offered a choice, pick the more finely ground fino for tamale making. Do not confuse masa flour with cornmeal -- they are made from different types of corn and you will not achieve the same results in your tamales if you use cornmeal. If a corn husk rips or one is too small, overlap two together and continue wrapping and tying as usual. Don't overstuff your tamales or they will leak out of the wrappers. Use less masa than you think you need, at least until you get the hang of it. Where you place the filling on the husk will depend on the wrapping style you choose, however, no matter how you tie them, the masa should always be spread on the smooth side of the corn husk. Have a tamale making party and divide up the duties -- assign different participants different fillings and sauces to bring to the party -- everybody shares in assembling and eating!